The meeting will be held in Curt Brink’s design center in the Mautz building at 945 East Washington Avenue with the first half hour of the meeting consisting of an open house for viewing of the three design options. BDG will then make a presentation and then seek feedback from the attendees. 4:30-5:00: Open house, to look at versions of proposal which are posted on the walls. 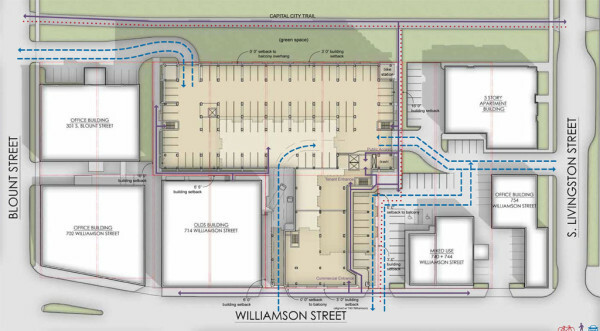 5:00 to 6:30: Bruce Woods will briefly review the 722 Williamson Subcommittee meetings, then the developers will present their proposal and the thinking behind it. Discussion follows. This entry was posted in Madison, Madison Commentary, Willy Street, Willy Street Commentary and tagged 2008 Capitol Better Urban Infill Development (BUILD) Plan, 722 Williamson Street, Baldwin Development Group, Blount Street, Bruce Woods, City of Madison, Curt Brink, Daniel Grossberg, David Lohrentz, Gary Tipler, Greater Williamson Business Association, Ground Zero Coffee, Jim Bower, Lindsey Lee, Livingston Street, LLC., Marquette Neighborhood Association, Marsha Rummel, Marty Rifkin, MG&E, Peter Wolf, Plan Commission, Preservation & Development Committee, The Eldorado Grill, The Olds Building, The Rifkin Group, Urban Design Commission, Wil-Mar Neighborhood Center, Williamson Associates, Williamson BUILD Program II, Williamson street by TheEastSider. Bookmark the permalink.